The choice of skills is perhaps unsurprising from the marketing chief of a data analytics technology provider, and an ex-CIO. But as organisations look to reorient themselves around the customer, marketers are being asked to bring value-based science and rigour into how that relationship is maintained. And it is technology, data and a hands-on approach to product development that provide the means of doing it. 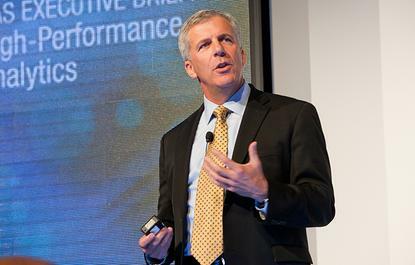 SAS CMO, Jim Davis, has led the vendor’s global marketing for the past decade and said data-based decision making, digitisation, technology innovation and customer-led communication have all had a profound effect on the marketing function today. “When I took the role on, it was more about what our collateral and website look like, do we have enough whitepapers, and where our media spend was allocated,” he told CMO. “Marketing has become more of a science and is quantifiable. As a B2B vendor, you don’t just do a trade show and collect business cards anymore; you start looking at marketing as more of an integrated effort, understanding there are various touchpoints along the way to turn a suspect into a prospect and into a legitimate lead. The other big change is the rise of the CMO to executive level. “I feel fortunate I have a seat at the table when it comes to company strategy. More and more CMOs need to be looking to that,” Davis said. In order to earn that chair, CMOs shouldn’t view themselves as a marketer but instead as someone who understands a market, Davis said. He also stressed the importance of recognising the product’s current and future possibilities. “If I am the CMO of a large wireless provider, I don’t necessarily have to know what the Qualcomm chip is doing inside the phone, but I do need to understand that device is a platform and no longer about just making phone calls,” he claimed. “In that case, you have to have a keen understanding of what technology is capable of. Davis is well versed in tech, having commenced his career in computer science as a software developer and rising to a CIO role. He then changed course by entering the publishing industry as a general manager, spending several years in that space before joining SAS 19 years ago. Davis’ initial focus at SAS was how to bridge the gap between the IT community and the end user. “SAS had always sold through the end user and in the process sometimes alienated the IT team,” he explained. Data warehousing was on the rise, and Davis became a program manager overseeing the vendor’s own capabilities before switching to its R&D division, then product development. Somewhere along the way, marketing fell into his remit. Davis was appointed CMO in 2001 and took on all marketing functions, but also manages to retain an eclectic mix of operational duties including publications, SAS’s education business, professional services in the United States, and HR. His primary focus, however, is on global consistency, marketing and product management strategy. The cornerstone of SAS’s approach today is using data analytics to better understand its own customers. An example Davis highlighted was using analytics to score leads, and identify when it’s time to turn them over to sales. SAS has also had to recognise the silos of information within its own organisation, and combine them to not only gain a better picture of customer behaviour, but also proactively improve their experiences. “There is a relationship between the tech support phone call and issue, with the type of training a user may be taking, or the book that might help them. Or it could be they’re on an older release of software and the sales and marketing teams need to contact them,” Davis explained. Becoming more customer-centric has also seen SAS reorient its business around value-based solutions and industry and domain expertise. This has been triggered by increased interest in data analytics at the boardroom level, Davis said. While most marketers are aware of how data analytics and technology can improve their customer understanding and interaction, the challenge has been utilising these successfully. Recent industry surveys indicate many organisations have attempted to take an analytics approach but failed to achieve demonstrable outcomes. A recent Fifth Quadrant survey, for instance, found half of Australian organisations fail in their big data analytics quest to improve customer experience. For Davis, failure is often linked to two factors: Marketing teams have either dealt directly with a vendor, believing the analytics platform just needs to be switched on to do all the work; or they’ve asked IT for a ‘customer relationship management system’, but IT doesn’t really know what that means. As a solution, he advocated bringing in a ‘data scientist’ or ‘marketing technologist’ to bridge the knowledge divide. “There is this concept of a data scientist out there and they are one of the keys to success,” he claimed. “But for me it’s not about someone who does data modelling, or has a PHD in mathematics; it’s someone who understands what those things are and what’s possible. One of the other challenges with data analytics is ensuring the insights are used for a practical purpose directly related to business value. The only way you can go too far is by just trusting the data, and not have some human interpretation, Davis added. Alongside the changing team structure and skill set, an equally important focus is how CMOs structure their relationships with executive peers. One of the ongoing hurdles preventing CMOs from accessing relevant data, technology and expertise is their relationship with the IT department. The CMO/CIO dynamic has been compared to a ‘shotgun wedding’, and Davis agreed both sides require shared metrics if they’re to ensure the relationship doesn’t end in divorce. “These shared metrics on the IT side need to go beyond SLAs associated with uptime, and focus on customer retention and acquisition,” he said. “The best situation would be if you look at your CIO and say they could be the CMO, and you look at your CMO and say they could be the CIO. That’s what we should be striving for – the CMO should know enough about what technology can do for the organisation as the CIO. The CIO also needs to understand what all that technology can do for the organisation and how it can interact with the customer. With 300 products and five target industry verticals to focus on, Davis is entrenched in understanding analytics technologies and committed to staying on top of technology innovation. He advised other CMOs to do the same. For Davis, the future of the CMO is about achieving real-time customer interaction. To do this, SAS is investing heavily in personalising website content management and digital marketing so that the experience is tailored based on what the company knows about its customers. “This has been talked about for a long time but you’re not going to find many companies actually doing this right now because the technology hasn’t been there,” Davis claimed. Ultimately, the holy grail is translating this information to the point where it’s consistent across all channels, Davis said. This involves making sure sales support systems are talking to the systems dealing with infrastructure around that online experience, as well as the tech support environment. “It’s also about monitoring every other possible channel of delivery and what we can do there, such as mobile,” Davis added. Embrace technology, and understand what technology can do for your operation. Partner with those that know the technology, and the CIO. Have a keen and intimate not only of what your product can do today, but what that product could potentially do as well.